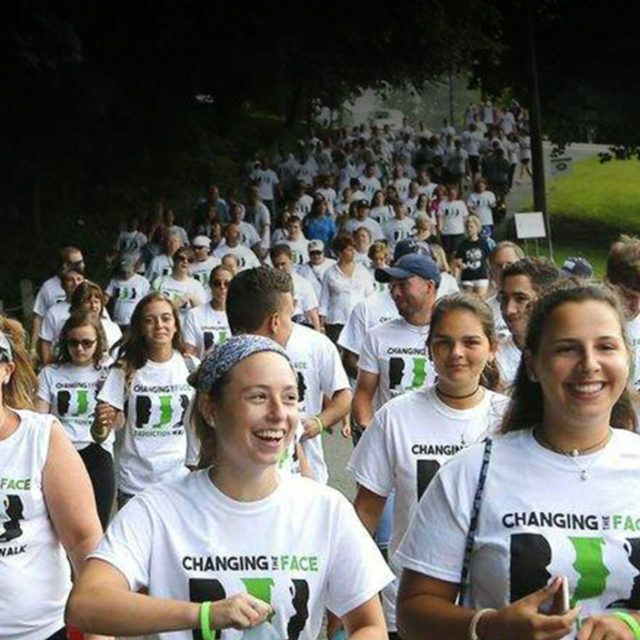 The 4th annual Changing the Face of Addiction Walk was a huge success! After a rainy start to the morning, the sky was blue by 9 am. Many of our amazing staff and volunteers were there by 8am (OR earlier!) setting up so that when the crowds arrived, we were ready to go. A lot of work went into this day. All of that work raised awareness and money- and while we don’t have the final numbers yet, it looks like we raised over $55,000. Meeting family members from our 20+ teams was overwhelming, knowing the loss they each had. But they were proud to be there, grateful to be able to talk about their loved ones, and glad to be at a place where they could share their pain and struggles along with the many memories they have of those they lost. One team, Team Ryan, raised over $6000 and had 71 people there on their team - check out their team photo on the hillside. A big thank you to the many police officers that volunteered their time, and were stationed along the route to help keep our walkers safe. Becky stopped to thank every officer personally for coming out and supporting our event. The SC Police Chief Association also supported the walk with a $500 donation! Thank you also to all Board members for their support, to Thor for running along the route as we walked to get so many great photos and also photos from the entire event, and to our entire staff for their hard work and dedication. Truly it takes a team, and Team CFPC was amazing! We are walking to raise awareness for those struggling with the disease of addiction. To help them find treatment and have the resources they need in order to get help. We will walk on August 4, 2018 in Franklin, NJ for our dear friend Ryan DeVito, in collaboration with Garden State Treatment Center. One hundred percent of your donation will go directly to The Center of Prevention Counseling (a non profit organization) to help those in need of services to aid them in their struggle with addiction. Ryan DeVito was raised in Lake Hopatcong, NJ. He was an amazing son to Ellen Geers and Scott DeVito. A 2009 graduate of Jefferson High School, where he excelled on the football field. He was an electrician and a past member of IBEW Local #102. Ryan also worked with his father at DeVito Roofing for several years. He resided in Landing and Lake Hopatcong, NJ before moving to Ft. Lauderdale, Fla. two years ago. Ryan enjoyed surfing, weightlifting, snowboarding and boating on Lake Hopatcong but most importantly, Ryan loved spending time with his friends and family. Ryan was one of the most naturally athletic people you will ever come across. Anything that involved a board came so naturally to him. His Sundays most of the time were spent on the beach of Fort Lauderdale with his raft. He was a unique character and his smile was one of a kind. He was an amazing friend and continuously showed up for the people in his life. He was so loved by everyone. Ryan passed away on June 2, 2018 at the age of 27 at his apartment in Fort Lauderdale. It was unexpected to many and devastating due to the fact that Ryan had been doing fantastic for years prior to this. We will continue to hold the memory and love we have for Ryan in our hearts. DEVITO WE LOVE AND MISS YOU!! Last year, Sussex County lost 36 mostly young souls to overdose. JOIN TEAM MIKE! Walk with us on August 4, 2018! People who become addicted to alcohol and other drugs are our sons, daughters, mothers, fathers, brothers, sisters, husbands, wives, cousins, loved ones and friends. Individuals may struggle for many years to regain control of their lives. The Center for Prevention and Counseling (The Center) hosts a walk in memory of two young men from Sussex County who lost their struggle with addiction. This year the walk is on August 4, 2018. The purpose of this walk is to change how addiction and individuals who struggle with substance use disorders are perceived. One hundred percent of your donation will go directly to The Center to help those in need of services to aid them in their struggle with addiction. Mike was always helping someone, he was “that guy that would give you the shirt off of his back”. What better way to honor him then to raise money in his memory to help others struggling?? People who become addicted to alcohol and other drugs are our sons, daughters, mothers, fathers, brothers, sisters, husbands, wives, cousins, loved ones and friends. Individuals may struggle for many years to regain control of their lives. The Center for Prevention and Counseling (The Center) hosted a walk in memory of two young men from Sussex County who lost their struggle with addiction. My Son George is one of the young men who lost his struggle. October 19, 2014 changed our lives forever. My family and I wanted to do something positive to something so horrific. The purpose of this walk is to change how addiction and individuals who struggle with substance use disorders are perceived. One hundred percent of your donation will go directly to The Center to help those in need of services to aid them in their struggle with addiction. People who become addicted to alcohol and other drugs are our sons, daughters, mothers, fathers, brothers, sisters, husbands, wives, cousins, loved ones and friends. Individuals may struggle for many years to regain control of their lives. The Center for Prevention and Counseling (The Center) hosted a walk in memory of two young men from Sussex County who lost their struggle with addiction. The purpose of this walk is to change how addiction and individuals who struggle with substance use disorders are perceived. One hundred percent of your donation will go directly to The Center to help those in need of services to aid them in their struggle with addiction. I have been inspired by many individuals to raise money for this wonderful cause. I walk in memory of many who have lost their lives to this horrible disease. My dear friend Elaine lost her son George Tizzano and formed this wonderful fundraiser with the help of “The Center” to raise awareness in his memory and others to change the face of addiction. I have a daughter who’s life has been altered and severely affected by this horrible disease since she is 14 years old. She is now serving time in prison with a 7 year sentence for committing a crime due to her drug addiction while chasing her next high. She has 1.5 years left and hopefully with the help of this wonderful organization she will be able to come out and find her place sober and clean and able to help others. Please help me raise money for this organization to save and change the lives and stigma of addition. Joe was unusual in that he always wanted help and was willing to accept any treatment recommended to him. He attended a program at Sunrise House in Lafayette when he was a senior at High Point High School. Joe was always grateful for that experience as he learned so much about himself, his depression and its effect on his childhood and his feelings of loneliness and isolation. Due to his depression, Joe did not feel the love of his family or his friends past the age of the onset of the disorder. His experience at Sunrise House changed that for him and he ultimately formed very close relationships with each member of his family. On March 19, 2010 Joe entered a rehab in Deerfield Beach, Florida. His stay lasted 40 days. When he was informed that he would be discharged on April 26th, Joey was panic-stricken. He did not feel that he was ready to be on his own yet and requested a little more time. That time was not afforded to him as his insurance company would not cover any further in-patient care. Joey was discharged and dropped back at his apartment on the evening of April 26, 2010. By 9 pm on April 27th, Joe had relapsed. He called home the following day requesting advice. As advised, he returned to the rehab seeking assistance. Joe was still extremely intoxicated when he arrived at the rehab center. He was transported to a detox center as his alcohol level was so very high. That evening, he was dropped back home to his apartment. On April 29th, Joe called the rehab and asked if he could sign himself into the 6 month in-patient program. He was willing to give up his job, his apartment, anything to get well. Sadly, he was turned away due to lack of insurance coverage. Joseph Michael Lavin passed away 64 days later on July 2, 2010. The cause of death was determined to be acute alcohol intoxication coupled with the interaction of the consumption of oxycodone tablets. No one wanted help more than Joe yet he was denied the help and care he so desperately needed. Joey’s story is a compelling one that needs to be told in order to effect change for so many others like him! Joe’s life was abruptly cut short but he led a substantive one. All who truly knew Joe would attest to his character. He was the personification of integrity, honesty, and loyalty. He possessed a phenomenal work ethic. His family was awed by the response to Joe’s passing by all who loved him here in New Jersey. If you were fortunate enough to be his friend, you knew you had found a “true” one. Addiction is a very treatable disease and every person who seeks to be well, deserves the opportunity to obtain treatment. Join My Team JOIN OUR TEAM! People who become addicted to alcohol and other drugs are our sons, daughters, mothers, fathers, brothers, sisters, husbands, wives, cousins, loved ones and friends. Individuals may struggle for many years to regain control of their lives. The Center for Prevention and Counseling (The Center) hosted a walk in memory of two young men from Sussex County who lost their struggle with addiction. The purpose of this walk is to change how addiction and individuals who struggle with substance use disorders are perceived. Most people who have the disease of addiction are ashamed or embarrassed and often do not seek help. Their families often feel the same shame. WE can change that! Addiction does not discriminate and will impact every person in one way or another. If not them directly, it will be their brother, sister, parent, child, spouse, co worker, boss, best friend…WE need to change how this disease is perceived so that more can be saved! One hundred percent of your donation will go directly to The Center to help those in need of services to aid them in their struggle with addiction. I walk to spread awareness in memory of my Son Jeremy who lost his battle on June 5, 2017 with co-occurring disorders of Bipolar and addiction We need a cultural shift in understanding Addiction. Most addiction begins with attempts to relieve physical or psychic pain and doesn’t take long to change the structure of the brain and become a disease in itself. Jeremy was a special son, brother, uncle, nephew, grandson and friend. Loved by all. He was funny, kind, and thoughtful. He had not found a medicine without side effects to manage his bipolar. He thought he had found his answer but it didn’t take long for his life to be taken away by fentanyl toxicity. Since dealers have been passing off fentanyl for other drugs deaths have tripled. Youth need to be aware of this increase in danger. People who struggle with substance use disorders are our sons, daughters, mothers, fathers, brothers, sisters, husbands, wives, cousins, loved ones and friends. However, PEOPLE CAN RECOVER! Everyone deserves the chance to treatment & recovery services to regain control of their lives. The purpose of this walk is to change how addiction and individuals who struggle with substance use disorders are perceived. 100% of your donation will go directly to The Center to help those in need of services to aid them in their struggle with addiction. We invite you to JOIN TEAM VERNON COALITION and add YOUR spirit and support to this cause that impacts us all! Many of you know I work in the field of addiction and recovery. I witness the devastation of addiction on a daily basis. There is a ripple effect that creates pain for many people involved, including family, friends, children, and the individual diagnosed with a substance use disorder. What I also know is that there is HOPE in recovery, and healing IS POSSIBLE for all! I have witnessed this first hand in my personal life, and I see transformation happen on a daily basis in my professional life. We need more funding to provide support to those afflicted and affected by addiction. My name is Danny Thomas and I am an alcoholic. I am an ACOA, an adult child of alcoholic parents who desires to recover from the effects of growing up in an alcoholic or otherwise dysfunctional family. I am a father to a beautiful and amazing baby boy named Ciro, who will be 2 years of age on 06-14-2018. i have worked in the Social & Human services for over 16 years, providing the needed therapeutic supports to patients, groups, and families. I was passionate to help others, unfortunately, the person that needed the most help was me. I finally asked for help, the true “First Step” for me, and as of 03-05-2108, I am on my road of recovering. I am finally Drunk On Sobriety and SOBER AF !!! Join My Team Join Team Carlson Born and raised in Sussex County, there are so many memories! Bertrand Island, Gingerbread Castle, High Point State Park, Farm and Horse Show, Lake Mohawk Fireworks, Sparta Glen and so many more! I care deeply about my community and am hoping my family, friends (and all those I know that grew up in Sussex County back in the 70’s and 80’s) will support Team Carlson to help raise funds to assist those in Sussex County struggling with an addiction and in need of treatment and recovery supports. Contribute to this Team and come join us on August 4th by walking in person or virtually! People who become addicted to alcohol and other drugs are our sons, daughters, mothers, fathers, brothers, sisters, husbands, wives, cousins, loved ones and friends. Individuals may struggle for many years to regain control of their lives. The Center for Prevention and Counseling (The Center) hosted a walk in memory of two young men from Sussex County who lost their struggle with addiction. The purpose of this walk is to change how addiction and individuals who struggle with substance use disorders are perceived. One hundred percent of your donation will go directly to The Center to help those in need of services to aid them in their struggle with addiction. People who become addicted to alcohol and other drugs are our sons, daughters, mothers, fathers, brothers, sisters, husbands, wives, cousins, loved ones and friends. Individuals may struggle for many years to regain control of their lives. The purpose of this walk is to change how addiction and individuals who struggle with substance use disorders are perceived. One hundred percent of your donation will go directly to The Center to help those in need of services to aid them in their struggle with addiction. JOIN COALITION FOR HEALTHY & SAFE COMMUNITIES TEAM! People who become addicted to alcohol and other drugs are our sons, daughters, mothers, fathers, brothers, sisters, husbands, wives, cousins, loved ones and friends. Individuals may struggle for many years to regain control of their lives. For the past four years, The Center for Prevention & Counseling has hosted a walk in memory of two young men from Sussex County who lost their struggle with addiction. The purpose of this walk is to change how addiction and individuals who struggle with substance use disorders are perceived. One hundred percent of your donation will go directly to The Center for Prevention & Counseling to help clients in need of services to aid them in their struggle with addiction. We represent a group of people dedicated to helping people and families in recovery by raising awareness, working toward solutions and promoting recovery. Some of us are in recovery from addiction, some of us are family members in recovery, some of us are allies of recovery and many of us have lost loved ones to addiction. This walk was started in memory of two young men that passed away, and one hundred percent of your donation goes directly to The Center for Prevention & Counseling to help people that cannot afford treatment. Welcome to Team Closer to Fine! We are raising money to support The Center for Prevention and Counseling in Newton, NJ…a place very close to our hearts through a Recovery Walk. The Center provides essential services for those in our area struggling with addiction and seeking help to lead a clean, healthy life. In recent years I have become more involved in my community in raising awareness that Recovery is Real. When people are provided with correct resources and availability to care we can save lives and provide people with the tools that are necessary to be successful in long term recovery. I know this first hand having a family member who recently celebrated four years of being drug free and is now living a very happy and productive life. People who become addicted to alcohol and other drugs are our sons, daughters, mothers, fathers, brothers, sisters, husbands, wives, cousins, loved ones and friends. Individuals may struggle for many years to regain control of their lives. The Center for Prevention and Counseling (The Center) hosted a walk in memory of two young men from Sussex County who lost their struggle with addiction. I have had the privilege and honor to work side by side with these young men’s mothers to raise awareness in our community. Their hearts may be broken, but their bravery to share their story and their spirit to try to prevent other families from having to live with the pain they both are is nothing less then commendable. The purpose of this walk is to change how addiction and individuals who struggle with substance use disorders are perceived. One hundred percent of your donation will go directly to The Center to help those in need of services to aid them in their struggle with addiction. In closing, thank you for your support and helping to make a difference! My name is Jeff and I am someone in long term recovery. So many of my friends and family have been effected by this terrible disorder. So many people don’t know about recovery or are to scared due to the Stigma that surrounds this disorder . Please help me in changing that Stigma. People who become addicted to alcohol and other drugs are our sons, daughters, mothers, fathers, brothers, sisters, husbands, wives, cousins, loved ones and friends. Individuals may struggle for many years to regain control of their lives. The Center for Prevention and Counseling (The Center) The purpose of this walk is to change how addiction and individuals who struggle with substance use disorders are perceived. One hundred percent of your donation will go directly to The Center to help those in need of services to aid them in their struggle with addiction. Join My Team JOIN OUR TEAM! People who become addicted to alcohol and other drugs are our sons, daughters, mothers, fathers, brothers, sisters, husbands, wives, cousins, loved ones and friends. Individuals may struggle for many years to regain control of their lives. The Center for Prevention and Counseling (The Center) hosted a walk in memory of two young men from Sussex County who lost their struggle with addiction. The purpose of this walk is to change how addiction and individuals who struggle with substance use disorders are perceived. One hundred percent of your donation will go directly to The Center to help those in need of services to aid them in their struggle with addiction. JOIN MY TEAM! I am Walking to celebrate 35 years of Recovery and to support the efforts of the Center for Prevention and Counseling in Changing The Face of Addiction. I am asking my family, my friends, and especially those in recovery to join my team in this WALK on August 4th. You also can join the team as a virtual walker so please help sustain the efforts of the Center for Prevention and Counseling by donating. Thank you. The purpose of this walk is to change how addiction and individuals who struggle with substance use disorders are perceived. One hundred percent of your donation will go directly to The Center to help those in need of services to aid them in their struggle with addiction. People who become addicted to alcohol and other drugs are our sons, daughters, mothers, fathers, brothers, sisters, husbands, wives, cousins, loved ones and friends. Individuals may struggle for many years to regain control of their lives. The Center for Prevention and Counseling (The Center) is hosting a walk in memory of two young men from Sussex County who lost their struggle with addiction. The purpose of this walk is to change how addiction and individuals who struggle with substance use disorders are perceived. One hundred percent of your donation will go directly to The Center to help those in need of services to aid them in their struggle with addiction. Changing the Face of Addiction will be held on August 4th 2018. The event will included a one and a half mile walk, speakers, refreshments, music and local resources.